Today…. Today has been pretty awesome. Thanks again to Scott McCloud for mentioning the comic on his site. This guy is, if you were not already aware, the beginning and end of comics analysis, and it is incredible to me that he reads my stupid comic. If you have not yet read his books (Making Comics is extremely handy if you are a comics creator), you should definitely hit up your library and see what I mean. I’m trying really hard to climb back on the 2x a week wagon that I mysteriously fell off of. Part of the problem was extreme trepidation about setting up this scene, but I think I am over it. Check back sometime this weekend for page 10 and again, thank you all for reading. Yes, don’t let him go down there alone!! Great page, as usual. You freaking rock. Well its obvious that he just has good taste. Yes! 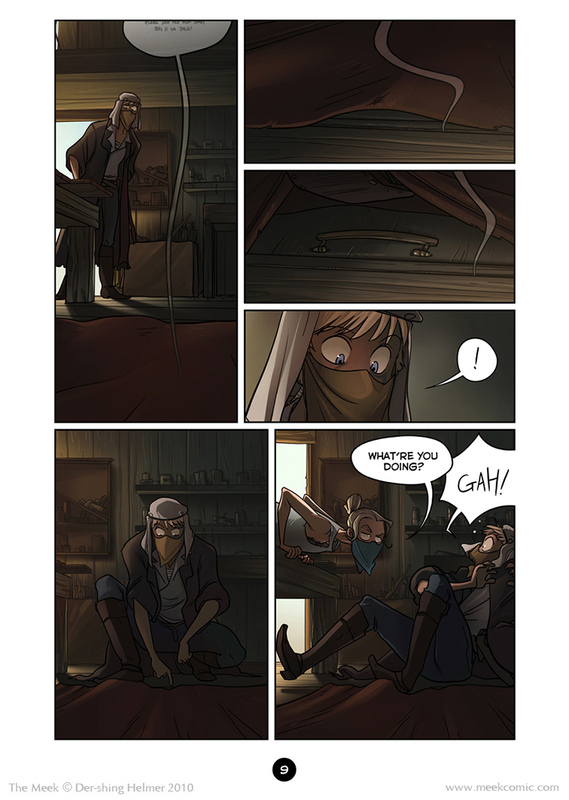 Another new page! Keep up the good work! P.S. I like broccoli too. Also, your amazing art & storytelling is a big deal!!!!!!! I saw that plug! Totally awesome, congratulations! No, not chest hair :) Good eye though! Back story, then someday??? YAY! Mighty curious now. The only thing I know about Scott McCloud is what Penny Arcade said 9 years ago. It’s not often I find a new web-comic with this much potential… I’ll be sure to check in regularly. And this people is why you need to keep QUIET when someone breaks in, Alamand clearly knows this! FFFFF SHE IS JUST SO AMAZING AAAAA. I just realized that I could cosplay Soli. I am just going to assume you have a giant ponytail mullet. Alamand just made the biggest stealth fail ever… Well…. Soli did…. but Alamand helped. Where’s Sam Fisher when you need him? Mr. McCloud is all sorts of awesome. I actually got to play wii sports with him and two of his comic buddies. I am horrible at the game. XD But he gave me a lot of seriously good advice about my art and comics. He and his family are all super cool people. I think it’s pretty cool that the way you’ve colored these pages makes the detail more apparent the longer you look at it; like your eyes are adjusting to the light. Ooh, I was wondering where the radio equipment was… It’s in the basement ! I am getting some Raiders of the Lost Ark vibes from that fourth panel, might just be me, but it (and this entire scene) are totally fantastic. Soli makes the best expressions evar. I am not even joking. Now don’t call your comice stupid. I went to school for the stuff and I can’t draw half as good as you. That’s why I’m going to another school so I can get half as good as you. So Alamand really has piebaldness? I think that’s just the light coming in from outside. His tank top is very loose, so what you’re seeing is some of the light reflecting off his chest. Also, I love both of their expressions. Soli’s face is priceless, while Alamand is sporting one of the best People’s Eyebrows ever. Why do I find her expression in panel 1 so awesome? Also – never fear, ALAMAND’S HERE. To help with all your trapdoor/spelling related conundrums. Gah indeed, Soli, gah indeed. Haha, this really reminds me of my brother, awesome! since you don’t have a “vote”-button anymore, and since you are not doing any vote-incentives… will there be no way to get a wallpaper for this chapter, like for the other two? are you even doing one this time? Actually, I was going to bring the vote button back for the wallpaper :) I’m thinking beginning of next month, since all the players in this chapter will have been intro’d by then! That’s awesome that Scott McCloud reads your comic! I saw him at Comic Con, but only briefly. He is an amazing person when it comes to comics. I don’t know what that is! But for you, I will look into it. Such a shocking face, I was surprised that he didn’t pull his gun out. 8U Is that chest hair I see on Alamand or am I just seeing things? …Most random observation ever, but I just realized that Alemand’s name is just one extra ‘L’ away from the French word for German. :I Guess I’m learning something in that class after all. Also, Alemand is awesome at stealth. For srs. Just found this comic. I’m in love. Very glad it’s not hundreds of pages long already or I’d have even less spare time. Wow, that must feel pretty awesome! Congrats! Scott McCloud has been a great help to me + still learning from his books – I use his “Understanding Comics” and “Making Comics” as comic-bibles! I don’t mind that the comic was at a slowish pace the last few pages. That’s what separates this from being just a “webcomic” that needs to have a mini-story and a punchline at the end of every page. For people reading the whole thing in one go, this works far better. The comic was fantastic quality, and I love the little extra bits you included at the end. I’ll make sure to keep it in good condition :] Keep up the fantastic work! Thank you so much for reading :`D And I’m glad you got your comic on time as well! I apologize for it being late (sort of), it was my publisher’s first time offering a smaller paperback type book, and we sort of underestimated the interest D: I really had nooo intention of signing about turned out to be 700 books when I agreed to the preorder thing. This time around for Chapter 2 we’re going to limit the special preorders and make sure the books will be sent out in faster batches. I’m super excited for Ch2 though, the minicomic at the end is one of my favorite comics I’ve ever done. Ohhh snap. I’ll need to keep my eyes open for a signed copy of the second one then. LOL. I can’t believe you quoted that old show. congratulations on getting featured by Scott McCloud :D That’s awesome!!! Ohhh, Scott McCloud is my husband’s idol. “Making Comics” is was motivated him to really start his own. Congrats on being featured! Also, got my Chapter 1 in the mail. YAY!